Normally with these Delorean Dashboard T Shirts you get a special date that signifies something or spells boobies upside down, but here nothing is dawning on me. Does anyone know if the dates chosen here mean something. I’m sure they probably do and I’m being totally dense and that’s sad, and the only way to brighten up that rain cloud is to buy the shirt because you love that Back to the Future franchise. Busted Tees recommends highly that you do business with them. It’s good for your mental health. They go to 2015 in Part II, so I’m still baffled by the July 5, 2010 date. Oops. 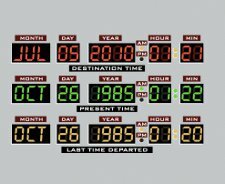 I think I figured it out: http://www.seanpercival.com/blog/2010/07/05/back-to-the-future-day-july-5-2010/ – some Twitter misinformation campaign got people thinking July 5, 2010 was the Back to the Future II day but it’s not, but it still spread. People….that’s an Internet meme.